The analysis of Arun Jaitley’s Budget has focused on issues like the fiscal deficit, boost to infrastructure, and sundry tax measures. Yet in terms of life and death, by far his most important proposal is the scheme to provide LPG (cooking gas) to the poorest 50 million households over the next few years. This finally shows sensitivity to one of India’s greatest health hazards that has long been ignored. The chatterati are much agitated by outdoor pollution affecting all our cities. Yet indoor pollution has always been a far greater health hazard, killing and maiming millions. “Indoor pollution? What’s that?” many people ask me. The answer: smoke from cooking chullahs made of clay or stones, fuelled by firewood or dung, used by 700 million Indians. Professor Kirk Smith of UCLA, the world’s top authority, estimates that smoke from an Indian cooking fire is the equivalent of smoking 400 cigarettes per hour (note: per hour, not per day). The WHO estimates that this kills 1.2 million Indians per year. Chullahs also produce carbon monoxide, but rarely in lethal doses. The most deadly is PM 2.5, particles under 2.5 microns that lodge in the lungs and cause cancer and TB. Smith says women cooking with biomass daily inhale more than 10 times the WHO norm for PM 2.5. The chatterati are obsessed with outdoor pollution, which can kill them. But indoor pollution does not threaten elite households using clean cooking fuels like cooking gas or electricity. It threatens only poor folk using biomass. And so the elite couldn’t care less. Respiratory diseases are the second biggest killers after unclean water. TB is especially vicious, since it spreads fast. A National Family Health Survey (NFHS) study suggests TB incidence of 1,046 cases/lakh population for unclean-fuel users versus just 296/lakh for clean-fuel users. One study suggests that 51% of all TB cases in India (and 59% in rural India) are caused by cooking smoke. Biomass smoke makes people blind. 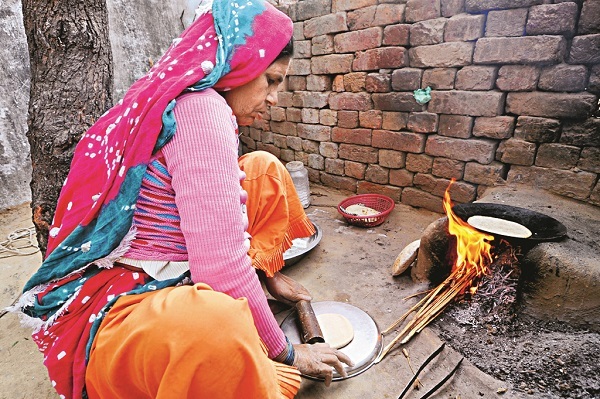 One NFHS study of women showed that blindness was 8,967 per lakh population in biomass homes compared with 6,152/lakh in cleaner-fuel homes. Up to 17% of partial blindness and 20% of complete blindness in rural homes could be attributed to cooking smoke. In recent decades, many attempts have been made to improve the traditional chullah. Modern chullahs have been designed to improve fuel efficiency and reduce smoke. This could in theory reduce the rural female workload of collecting firewood, reduce deforestation, and improve health. Many states installed millions of modern chullahs in villages. Yet every follow-up survey showed that most modern chullahs lay unused or broken. There are many reasons. One study back in the 1980s cited a villager who abandoned modern chullahs saying that an open fire not only provided cooking heat but also lit up the house (almost all villages lacked electricity). Modern chullahs cut out the light and plunged homes into darkness. Another villager said smoke from an open fire was a useful insect-controller that drove away insects living in thatched roofs. Whatever the many reasons, the modern chullah programme simply failed. Women continued to use biomass in traditional chulhas, with no realization that they were slowly killing and maiming their families. Switching to cooking gas will be very expensive. But it will do wonders for rural health. Jaitley said in his Budget speech that the government aimed to provide concessional connections to no less than 50 million families in coming years, covering the poorest quarter of the population. However, his Budget provided a pittance: just Rs 2,000 crore to meet the initial cost of subsidizing 15 million LPG connections to households below the poverty line. The scheme will continue two more years to cover 50 million families. Oil minister Dharmendra Pradhan says the connection subsidy will be Rs 1,600 per family. The normal cost is Rs 3,400 per connection. Gas is an excellent clean fuel but is unaffordable for the rural poor. Poor families using free firewood and cow dung as fuel today will shift to clean gas only very gradually. To begin, the rural elite, parading as the rural poor, will be the main beneficiaries. Besides, it will take years to create an all-India rural network of cooking gas dealers who can supply new cylinders and take away used cylinders. The ground reality will be slow, incremental progress. I am not usually a votary of expanding subsidies. But I fully support subsidies for rural cooking gas to save rural lives. Future budgets must provide far bigger sums. At last we have recognized a huge problem terribly neglected for decades. The emphasis is no longer on fuel efficiency through modern chullahs, but on saving rural lives through clean fuels. That is a welcome, overdue change of approach.